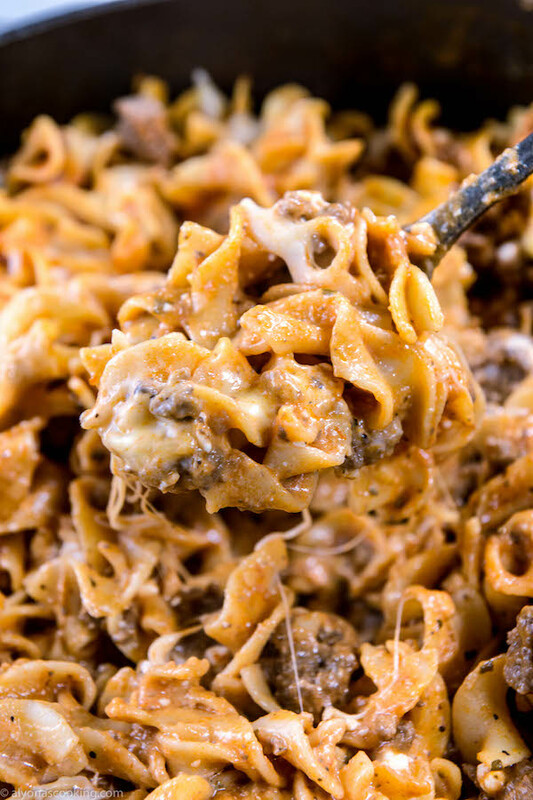 Beef Stroganoff is apparently a Russian beef dish with a sour cream sauce and this ONE-PAN sour cream noodle dish has a cheesy side to it with no mushrooms. 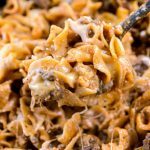 Call it Sour cream egg noodles if you desire but sour cream, egg noodles and beef deserve the stroganoff title! 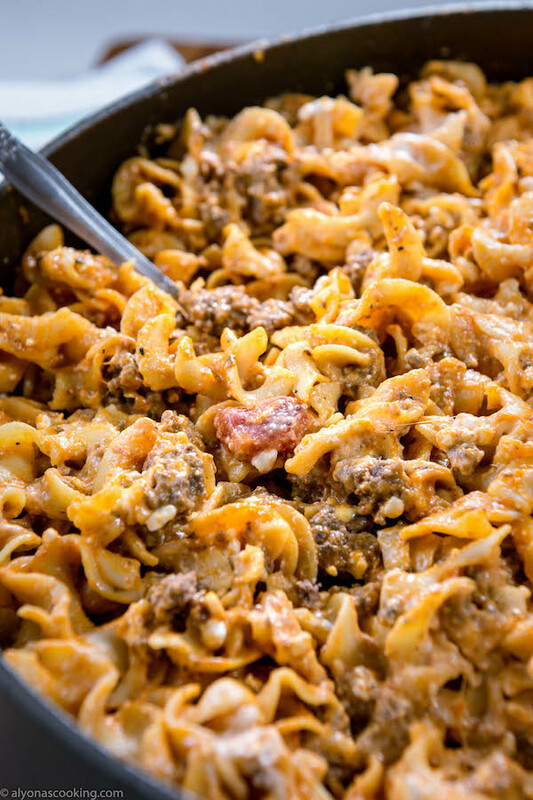 This recipe is a MUST try if your up for one-pan dinners! 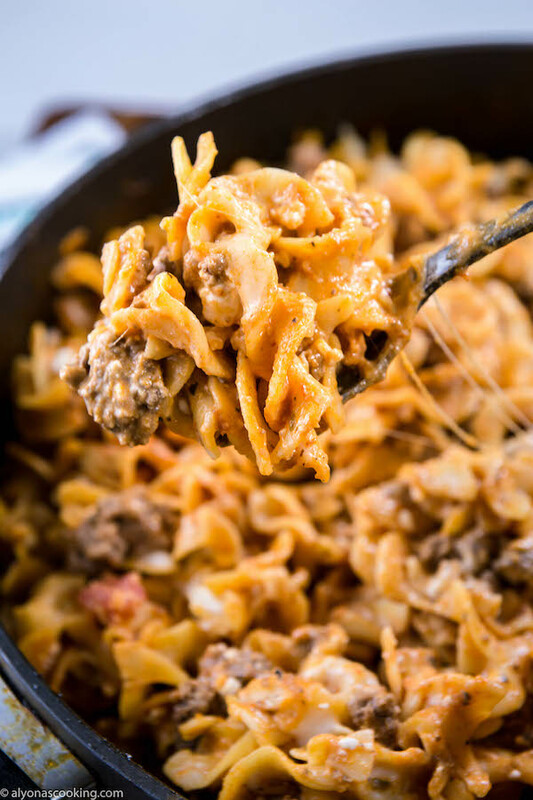 It’s super easy to put together since its all done in pan and can be versatile too–just switch out the jarred sauce for plain tomato sauce or even change up the cheeses and add spices to your liking if you wish but don’t skimp on the SOUR CREAM. 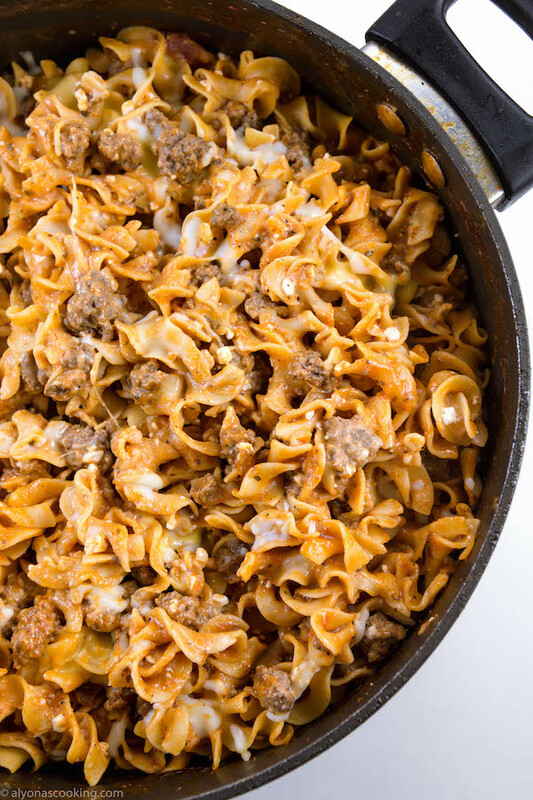 A one-pan meal to TRY! 1. In a deep skillet brown and crumble the beef. Drain the grease, add the Worcestershire sauce, salt & pepper and sauté until aromatic. Then add the water (broth if using) and jarred sauce and bring to a boil. 3. 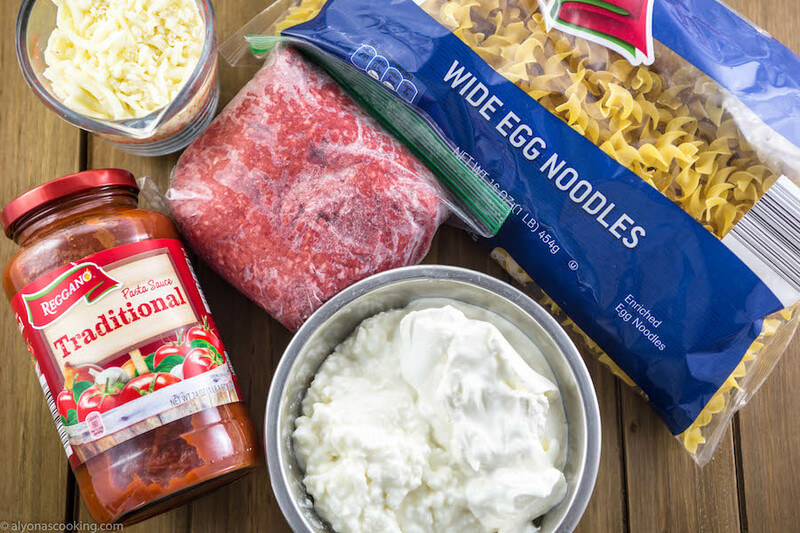 Stir together the cottage cheese and sour cream and add to the noodles. Heat throughly over low heat and sprinkle with shredded cheese before serving. 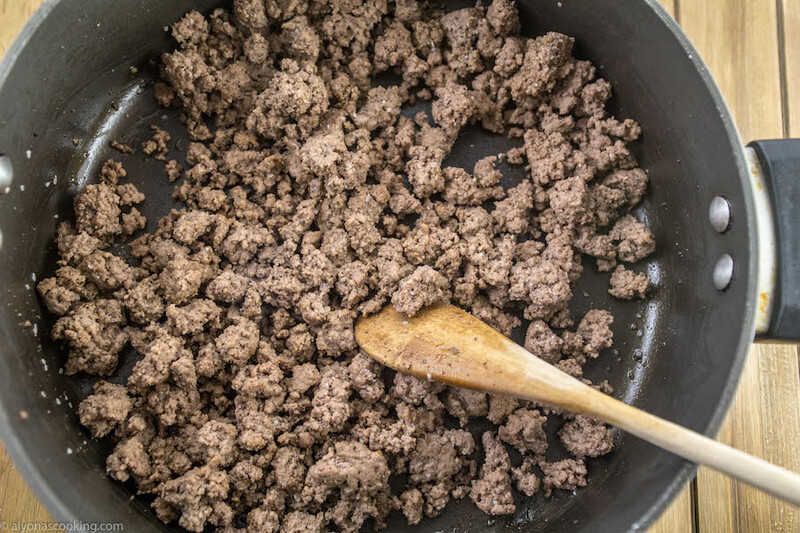 In a deep skillet brown and crumble the beef. Drain the grease, add the Worcestershire sauce, salt & pepper and sauté until aromatic. Then add the water (broth if using) and jarred sauce and bring to a boil. 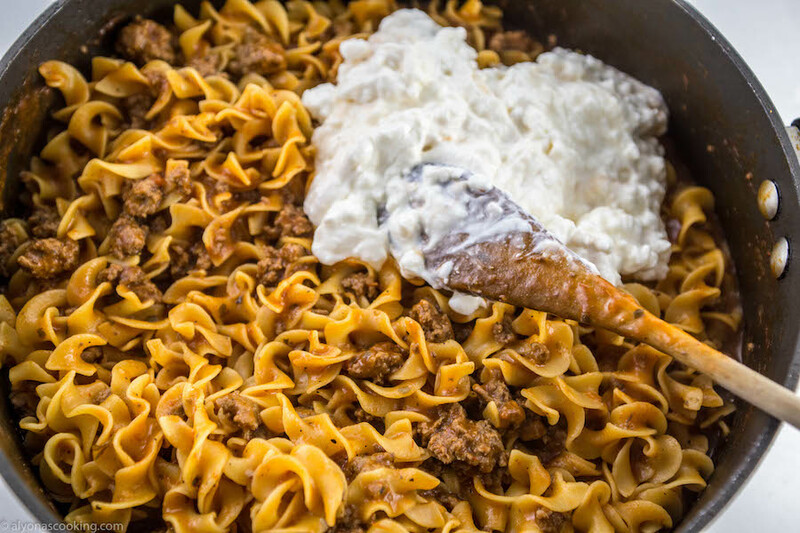 Stir together the cottage cheese and sour cream and add to the noodles. 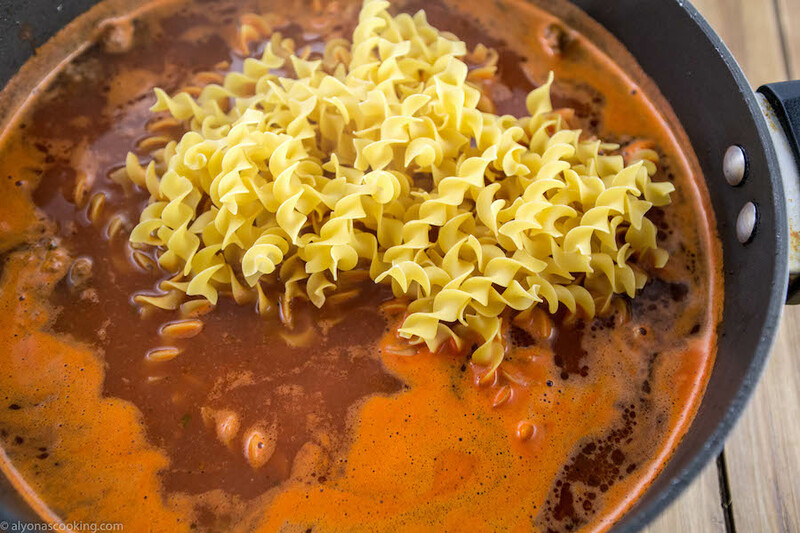 Heat throughly over low heat and sprinkle with shredded cheese before serving. Very yummy! My pan does not heat thoroughly (large pain on small cheap stovetop) so it took about 17 minutes to boil out all the liquid. Great recipe, just had them for lunch. Thank you.